I may be many things. But I've never claimed to be good at nail art. No, in fact I am quite terrible! Unless we're talking polka dots or a VERY simple, probably sloppily done French manicure, I am not your nail art gal. But that's where the Whats Up Nails Kisses Stencils come in "handy" (pun intended)! I've been following Whats Up Nails on Instagram for awhile now, and I've constantly coveted both their nail stencils and the nail polish brands they sell. 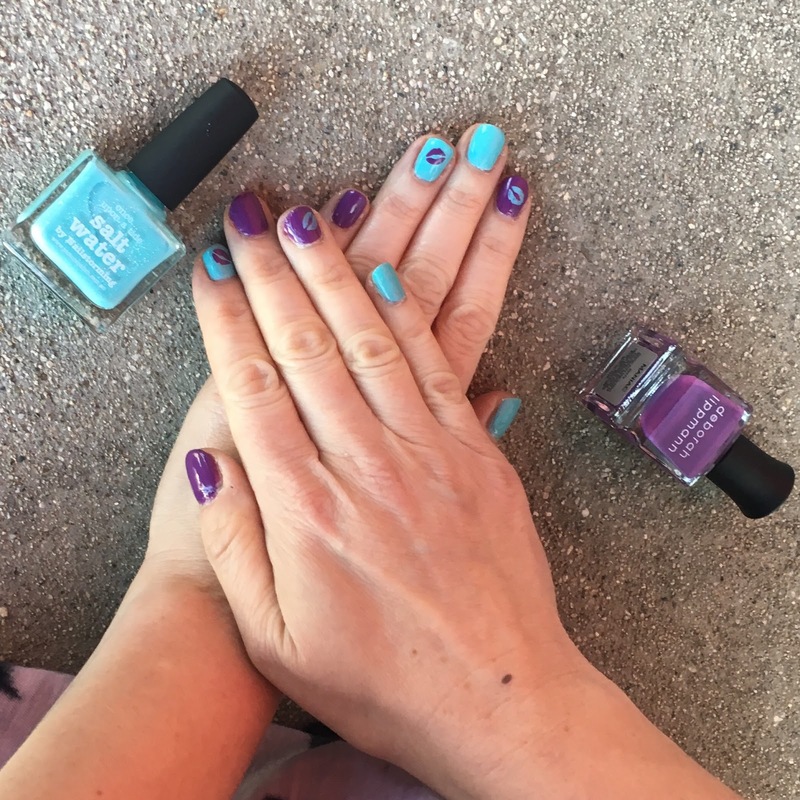 I finally bit the bullet about a week and a half ago and ordered two absolutely gorgeous Picture Polish nail polish shades (one of which I used here), in addition to a ton of different nail polish stencils! I figured the stencils were only $3.75 for a sheet of 20, so if they didn't work, it didn't matter too much. So about $50 worth of stencils and polish made their way into my cart, I bought them and I waited for the magic to arrive. And arrive it absolutely did! I've been wanting to try Picture Polish for, oh, I don't know -- FOREVER! All of their shades are insanely gorgeous and so unique. It was honestly difficult to only settle on two, but I decided that I should start small in case I didn't end up loving the formula. (Spoiler alert: it's amazing and I will be buying ALL. OF. THEM.) I purchased Picture Polish Orchid (a beautiful shimmery purple that you will definitely see in the future) and the color you see here, Picture Polish Salt Water (a pastel turquoise jelly with scattered holographic mini glitter). Yeah, I'm obsessed. I knew I wanted to do a dual color manicure with Salt Water as the focus, and I wanted to combine it with a rich purple hue. And while I love Orchid, I wanted to save that for a different manicure. I had one color in my collection that I thought of immediately -- Deborah Lippmann Maniac. Maniac is just that perfect creamy violet that makes a statement but somehow doesn't seem over the top at the same time. I also loved the combination of the shimmery turquoise with the solid violet. So we were off and running! Look how adorable these stencils are! I love how much usage you can get out of each one. Originally I was going to use the Whats Up Nails Unicorn Head Stencils for this manicure. Because, seriously, how cool would unicorns look with these two shades? They're made for unicorns! Full disclosure, though -- the unicorns just didn't look like unicorns once I applied them to my nails. I tried three times, and each time they just looked like weird fuzzy messes. So I scrapped that idea and went for the kisses instead. The Whats Up Nails stencils are extremely easy to apply. They're stickers, so you just peel the one you want to use off the sheet and stick it onto your nail. You then brush the polish of your choice over the open space, peel off the sticker and voila! Nail art in seconds! 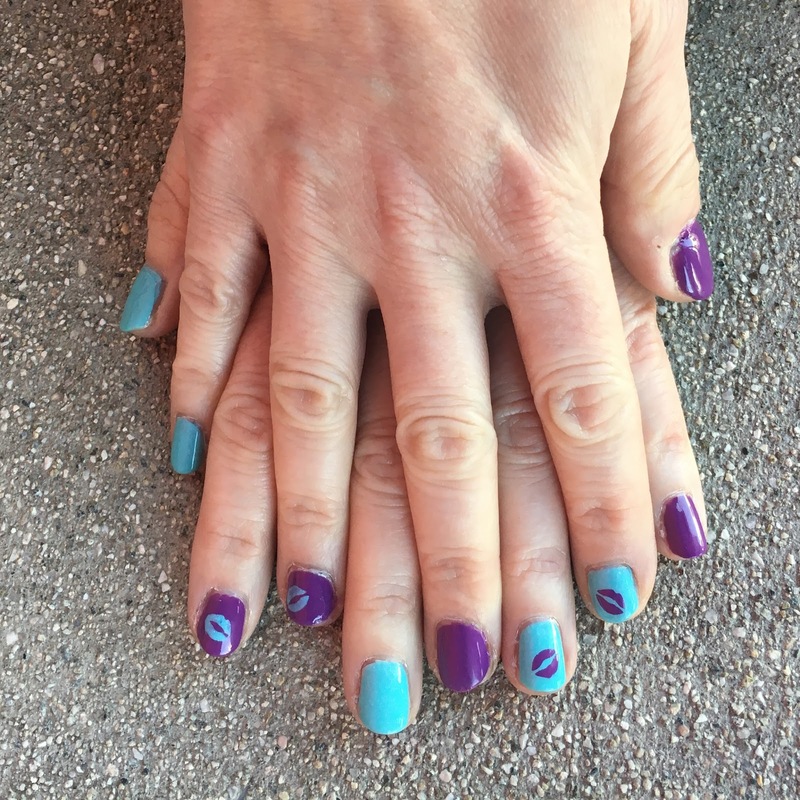 You just have to make sure that your nails are completely dry before you apply them, and that you wait long enough to apply top coat that you don't smear the design from the stencil. 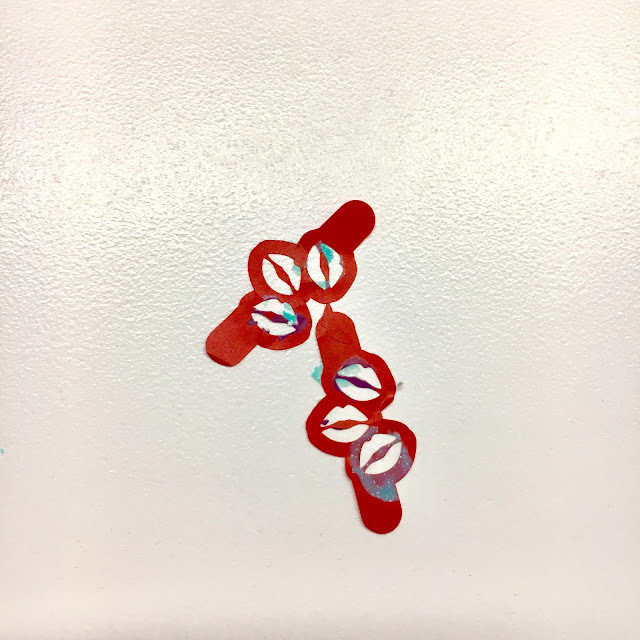 I actually was able to use one stencil for two nails, because I only applied one kiss to each -- so, rather than wasting four of the 20 stencils on one manicure, I only used two! I knew I wanted a single kiss on each nail rather than going for the full three that the stencil includes, I just thought my nails would look too crowded with more than one kiss each. I also knew that I wanted a combination of solid and printed nails -- and that I wanted each hand to be the opposite of the other. Psst ... I have a secret for you! 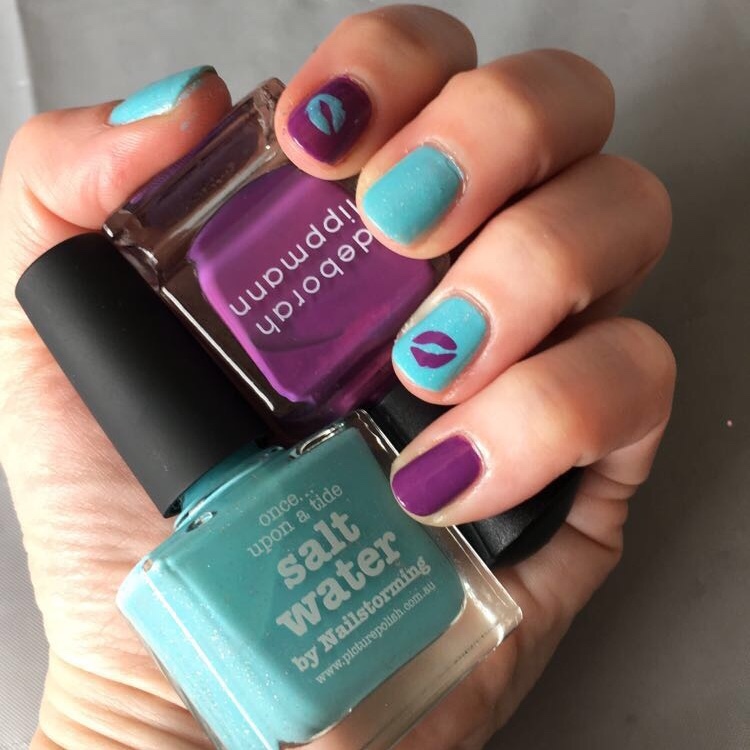 I can't recommend Whats Up Nails stencils highly enough -- they're so easy to use and they immediately transform your manicure into something fun and unique. And Picture Polish? Um, I will be buying ALL of you. The Whats Up Nails Kisses Stencils retail for $3.75 for 20 at whatsupnails.com. Picture Polish Salt Water retails for $15 at whatsupnails.com. Deborah Lippmann Maniac is no longer available. Adorable! And I like the shades you picked. I'm in the same boat as you when it comes to nail art. I've never tried a stencil, but maybe I could manage this! What a cute mani idea! I remember loving Deborah Lippmann polishes. They had a great deal on these at my local TJ Maxx, and I bought like 15 of them at once. The formula wears like iron on my nails! This is such a cute and fun mani! Oh wow I love it! I wish I could do nail art myself! I want those kisses. I'll have to order them. I have a few Picture Polish shades and they are fabulous. They last really well on my nails. This is my favorite mani on you. Those are the most adorable kisses! I love this mani! What a pretty colour combination! These are super cute. Love your pose with them!